As the gears churn in Blizzard’s MMO factory, the components of brand new dungeons clunk onto the production line. Monsters squeal as they’re forced from their hatcheries, and shining loot is being forged ready for adventurers to discover. If you just can’t wait to find out what lurks in World of Warcraft’s next expansion, Blizzard have provided a little preview of what’s to come in the game’s eight new dungeons. The collection is split into two camps: ‘level-up’ dungeons and ‘maximum level’ dungeons. The first four comprise of dungeons that are tiered from level 90 upwards, whilst the final four will only be tackled by the most elite level 100 players. The dungeons designed to help level up players will be the Bloodmaul Slag Mines, designed for those between level 90 and 92. With that completed you’ll move onto the Iron Docks until you hit 94, then Auchindoun up to level 97, and finally Skyreach for the final stretch from 97 to level 99. Dinging to level 100 opens up Shadowmoon Burial Grounds, The Everbloom, Grimrail Depot, and Upper Blackrock Spire. All level-up dungeons will be populated by four brand new bosses each, as well as some extra special loot. The max-level dungeons contain 3 or more bosses, with Everbloom and Upper Blackrock Spire boasting a whole quintet of them. The Warlords of Draenor storyline will be woven through the dungeons, with enemies like Shadowmoon chieftain Ner’Zhul making more than one appearance. 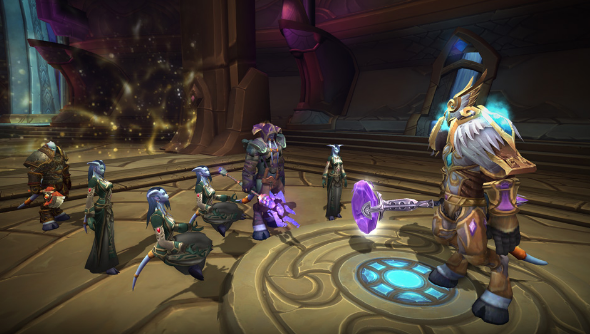 The Training Day preview offers up detailed insights into each of the new dungeons, although their true secrets won’t be revealed until the Warlords of Dreanor expansion hits on November 13th.